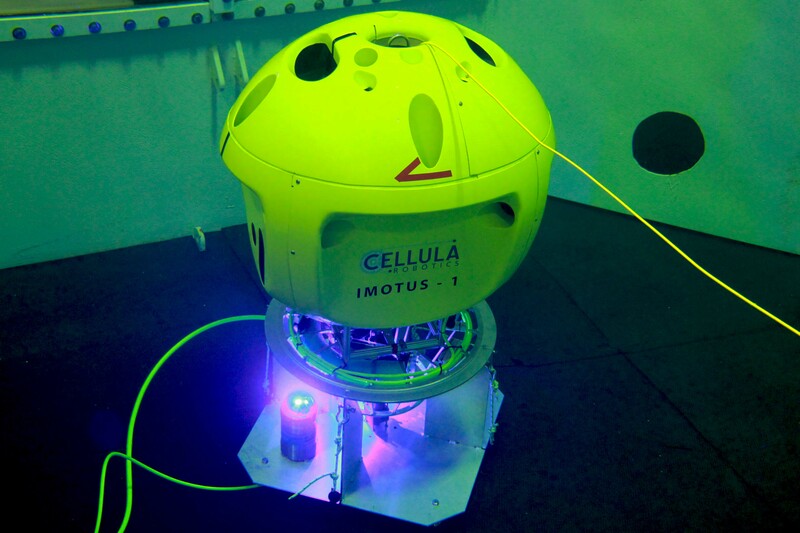 November, 2017, Cellula Robotics Ltd. (Cellula) has successfully demonstrated its Imotus-1 Hovering Autonomous Underwater Vehicle. During a week of testing at local pool facility, Imotus-1 navigated using proprietary SLAM algorithms and was shown to hold station, waypoint track, maneuver around obstacles and dock to an underwater charging station. Inspection tools including point cloud map generation, high definition video, an ultrasonic thickness gauge and a light cleaning brush were also demonstrated. The docking demonstration was sponsored by Ocean Networks Canada. This demonstration included communications between Imotus and the docking station using a blue-light modem, followed by autonomous docking. When in the dock, Imotus received power and high bandwidth communication via a WiSub pin-less connector. Imotus-1 uses Simultaneous Localization and Mapping (SLAM) algorithms to enable navigation, station keeping, route following and autonomous operation within confined space environments. Development of SLAM was made possible through funding from the National Research Council’s Industrial Research Assistance Program (IRAP). In the first quarter of 2018 Imotus-1 will be used in the North Sea for commercial survey and inspection work inside the structural legs of an offshore platform.